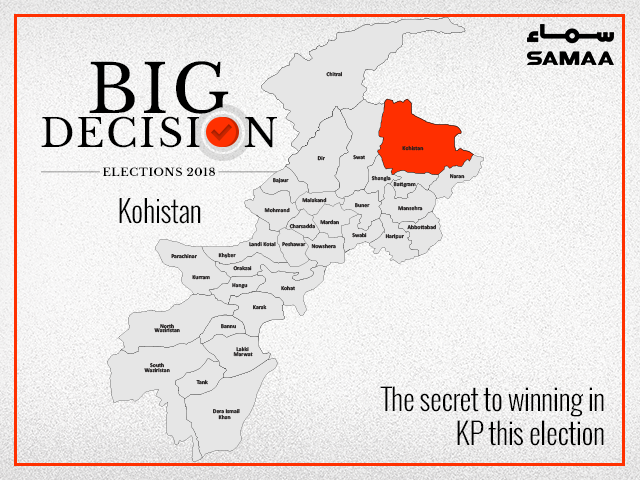 Religious parties are considered the strongest in Kohistan and the second most important thing to know is that in this area they don’t accept “imported” candidates. Most of the vote bank is distributed among communities and they stand by their candidates rather than candidates running the show. It is also a well-established fact that the people of Kohistan have an unwritten agreement among themselves that they will not support any candidate from any political party — they will favour candidates on the basis of community. This is why the strongest candidates in Kohistan (NA or PK) are standing as independents. From NA-11 Malik Arfeen is considered to be the strongest man. He seems to have little opposition. From the Kandiya community, Didar Khan is standing for PK-25 and is considered to be the winning candidate. From PK-26 Abdul Ghaffar from the Ranonya community is the strongest candidate and Mufti Ubaid ur Rahman for PK-27 is supported by the Tarag community and is supposedly the strongest man.